Have you ever been dreaming about having a luxury car? 1xBet Casino’s new raffle could turn your dreams into reality. 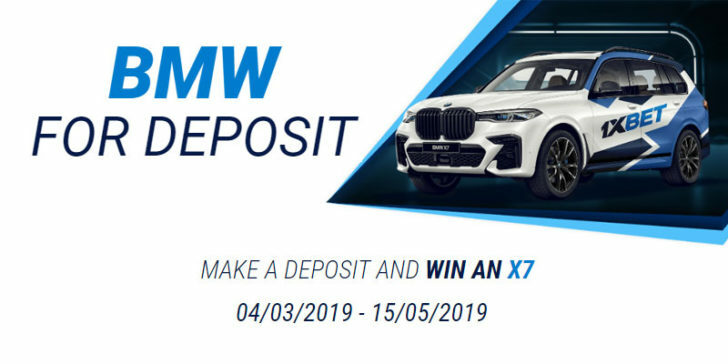 If you deposit your account until 15/05/2019 with at least €7, you have the chance to win a BMW X7. 1xBet Casino gives away plenty of gifts and bonuses as a part of their new raffle. With a lucky ticket, you can get valuable bonuses, one of the 2 iMac PROs or 3 iPhone XS MAXs. Furthermore, if you get super fortunate you can even win a brand new BMW X7. The number of tickets you get depends on the amount of money you’ve deposited. With min. €7 you receive one ticket, with €14 you get three. You can even get 350 tickets if you deposit your account with at least €689. Of course, if you have more tickets, your chances are higher to win a BMW X7 or some of the other valuable prizes. For more information on the promotion please check out the website of 1xBet Casino. Get your tickets at 1xBet Casino! Our latest review about 1xBet Casino shows there are plenty of exciting TV games, slot and live casino games available on their site. It’s a trustworthy, fun site with plenty of other promotions. It’s definitely worth a visit if you’re into gambling. Check out the latest online sportsbook promotions in Germany! To learn more about the best Online Sportsbook Sites in Germany, have a look at the Online Sportsbook Reviews section.